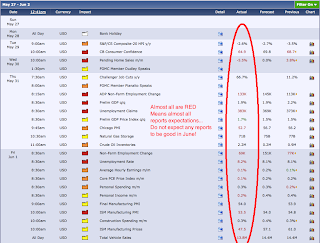 Daniel Loh: It's not a good June to go Bullish! It's not a good June to go Bullish! Friday is the first day of the month. Upon looking at all the reports that were released last week, almost all miss their expectations. See the red figures on the actual column. Today's Factory orders also missed expectations. 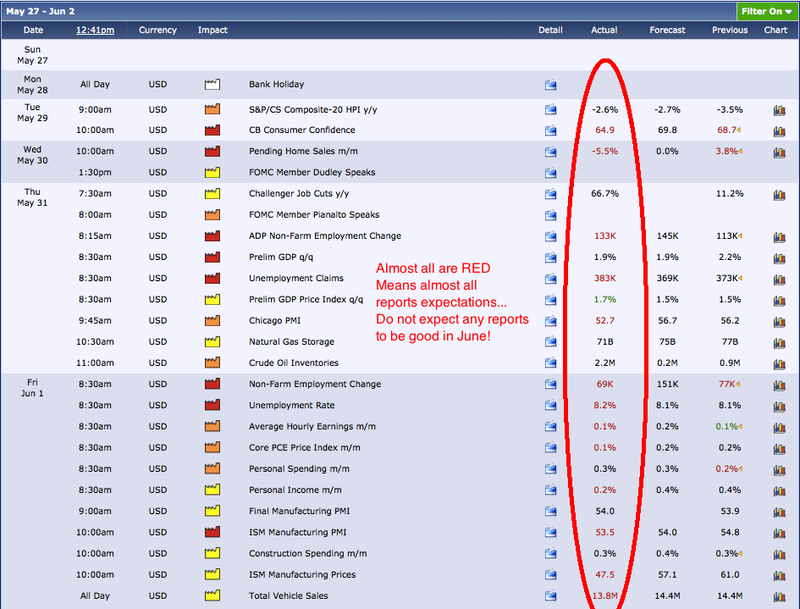 All reports, no matter it is public or enterprise reports are likely to be worse than expectations in June. That means only one thing, the market might slide continuously down. I hope that there is a turnaround with some government stimulus this month. Apart from that, I can't see reasons for any upside movement in the market now. Just be very careful in going into ANY BULLISH position. Cash is king now. If not, take some bearish positions whenever possible. Of course I am saying that every stocks will go down. Some stocks will go up too. But note that market is not in your favour now. But having said that, let us rejoice as I believe sunshine will come after every heavy rain. Without this fall, we would not have a strong rebound. Let us preserve our cash to double our profit whenever the market rebound. Will this Friday 29 June spark a turnaround? Can you BUY and HOLD stocks now? US Stock Tip: FACEBOOK going crazy as predicted! US Stock Tip: Time to Buy Facebook now?? Do you jump in to buy singapore stocks now? What is the Trading Strategy for June now? US Stock Tip: Time to focus on Facebook? ?